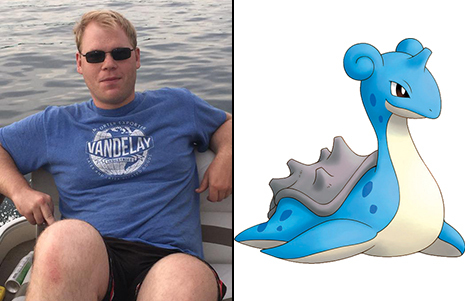 The New York man who wrapped his car around a tree while playing “Pokémon Go” is a former Marine who was trying to “catch” Lapras, a blue sea creature, right before the crash Tuesday night. Steven Cary, 28, suffered a broken ankle and leg lacerations when he slammed into the tree while driving alone near a lake in Auburn, an upstate city about 25 miles west of Syracuse. Cary (left) and Lapras are pictured above. Cops report that Cary admitted to “actively playing the ‘Pokémon Go’ game while driving causing him to become distracted and run off the roadway into a tree.” He is expected to be cited in connection with the one-car crash. The Lapras Pokémon has a shell on its back and is “most known for its fondness of moving people and Pokémon across bodies of water,” according to Wikipedia. The large sea creature is reportedly averse to fighting, which makes them “an easy target for hunters.” Whatever that means. 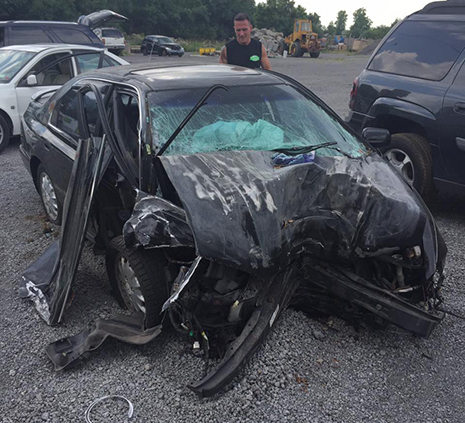 Cary was driving his younger brother Zachary’s 1996 Honda Accord, which (as seen below) is now totaled. Cary’s sibling has launched a crowd funding campaign to raise $3000 to purchase a replacement vehicle. Launched last night, the effort has so far raised $215.